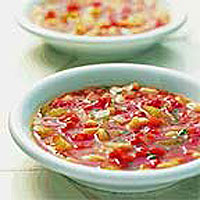 Create this soup in just a few minutes using basic store cupboard ingredients, such as Waitrose Cannellini Beans and Valfrutta Tuscan Chopped Tomatoes. Serve with crusty bread for a hearty, family lunch. It is perfect for vegetarians when made with vegetable stock. Heat the oil in a large pan, add the onion and celery and fry for 7 minutes or until they are softened. Add the garlic and stock and bring to the boil. Simmer, partly covered, for 15 minutes until the vegetables are tender. Drain and rinse the beans, then add to the pan with the tomatoes and seasoning. Simmer for 5 minutes, then stir in the parsley and serve.